This rendering visualizes signatures on Ceres that indicate the presence of organic material. On the dwarf planet Ceres, organic molecules are more abundant than scientists originally suspected. Last year, NASA's Dawn spacecraft detected organics, or carbon-based compounds, on the surface of Ceres. The exciting discovery raised the possibility that Ceres might be habitable and even that life could have once existed on the rocky world. 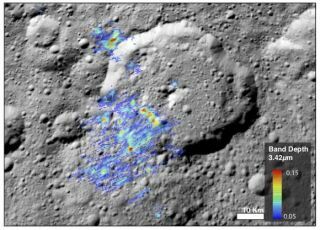 And now, a new analysis of the mission data suggests that the patches on the surface of Ceres shown to contain organic material likely harbor even more of those molecules than researchers first thought. It is important to note that the presence of organic molecules doesn't mean that life exists or ever existed on a world. Geological process on the surface, or even meteorite impacts, could create or deposit organics on a dwarf planet like Ceres. But scientists are still working to find the origins of these organics. The dwarf planet Ceres as seen by NASA's Dawn spacecraft in orbit. This image, which shows the bright spots of Occator Crater, was taken Feb. 11, 2017. Researchers first discovered organics on Ceres using the Visible and Infrared (VIR) Spectrometer aboard Dawn. By comparing the VIR data with the wavelengths of light released by organic material on Earth, researchers first surmised that about 6 to 10 percent of the signatures on Ceres could be attributed to organic material. In this new analysis, "We estimate that as much as 40 to 50 percent of the spectral signal we see on Ceres is explained by organics," Hannah Kaplan, lead author on the new work, said in the statement. Kaplan led the research as a graduate student at Brown University in Providence, Rhode Island, and is now a postdoctoral researcher at the Southwest Research Institute in Texas. This prediction is a drastic difference from the 6 to 10 percent previously estimated. Researchers came to this new conclusion by comparing the VIR data collected by the Dawn spacecraft with data on organics that came from space— ones that fell to Earth in meteorites. The researchers used extraterrestrial data for comparison as opposed to signatures from material formed on Earth because they felt the meteorite data was a closer analogue, the statement said. This new analysis of NASA's Dawn spacecraft shows that "you can get really different results depending upon the type of organic material you use to compare with and interpret the Ceres data," Kaplan said. These findings are "important not only for Ceres, but also for missions that will soon explore asteroidsthat may also contain organic material," she added. This work was detailed May 21 in the journal Geophysical Research Letters. Email Chelsea Gohd at cgohd@space.comor follow her @chelsea_gohd. Follow us @Spacedotcom,Facebookand Google+. Original article on Space.com.